1. To demonstrate the essential diagnostic tools and records needed to execute a prepless veneer case. 2. To demonstrate how to create Custom Composite Prototypes that will become the ultimate “blueprint” for the ceramist. 3. To demonstrate cementation techniques that insure long term success. Dr. Wells will first try-in the veneers dry and then he will use a clear try-in paste. 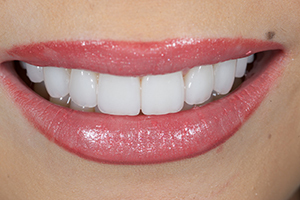 Dr. Wells assistant will prepare the veneers and then he will demonstrate the procedure for veneer placement. Dr. Wells demonstrates the finishing sequence. Dr. Wells continues to do the final finishing of the veneers.